In August, one of our Lutheran Volunteer Corps members started serving at the Child Care Center. Over time, she developed a beautiful relationship with one of the families there, and when tragedy struck, she stepped in to see how she could help. See The News Journal’s recent story on Morgan and the Drews. MOC Executive Guild member Janet Killian was recently featured by the NCC Chamber of Commerce for her involvement in multiple organizations that serve our community. Janet serves on the MOC Guild, where she helps co-chair fundraisers like Eleganza 2017, raising over $55,000 for our emergency shelters and Job Placement Center. In addition, Janet also actively supports the Mental Health Association of Delaware, the Delaware College of Art and Design, the Delaware Association of Police, the New Castle County Chamber of Commerce, the Delaware Contractors Association, the National Association of Women in Construction, and the Better Business Bureau. Thank you, Janet, for all you do for the Ministry! Out & About magazine recently highlighted the Ministry’s work on the Village of St. John, MOC’s soon-to-be newest residence for low and moderate-income seniors. The 53-unit apartment complex is being constructed on the grounds of the old Cathedral Church of St. John in Wilmington’s historic Brandywine Village neighborhood, and had its groundbreaking on December 15, 2017. You can view the story on Out & About here. “We’ve been doing this, it seems like forever,” Chet Norstrom said as he sliced into a pan of lasagna. 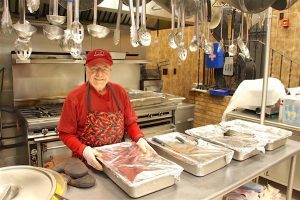 For almost 20 years, on the 10th of each month, he leads a group from his church, Lutheran Church of the Good Shepherd, in preparing lasagna at Emmanuel Dining Room. It all started with the church’s former pastor and his wife. “She had a special recipe for making lasagna that didn’t require cooking the noodles,” he said, and that made preparing big batches of lasagna much easier. That pastor has moved on, but Chet continues to bring 12 pans, holding 21 servings apiece, to the dining room each month. He gives credit to the staff who make help him in his efforts, meeting him at his car and carrying the heavy pans — about 20 pounds each—into the kitchen. “After I retired, I felt I had time to do something for the Lord. I remembered in the Bible, it says, ‘Feed my people,’” Chet, a retired engineer, said. “It just broke my heart to see all these people standing in line, trying to get food. It’s tough. There’s a lot of poverty around this area. 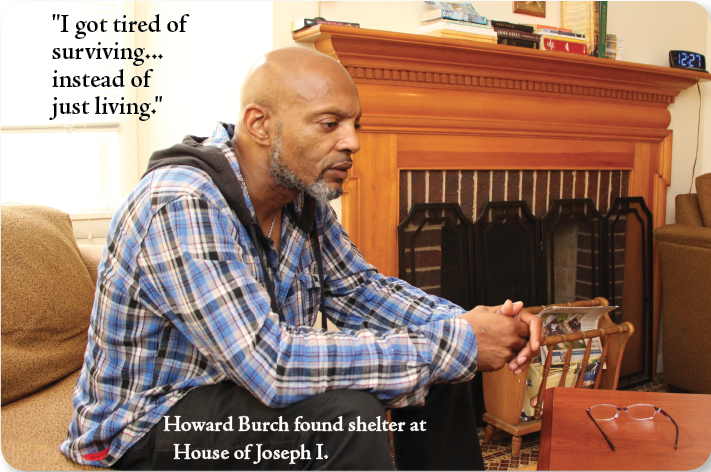 Howard Burch, a combat veteran, spent two nights in the woods before finding shelter at House of Joseph I. Shortly before he came to the Ministry of Caring, Howard Burch spent two nights sleeping outdoors. A 56-year-old Marine combat veteran who served in Beirut, Lebanon, Burch had post-traumatic stress disorder stemming from his service, compounded by strife in his family. Burch was recently divorced and had been living with an Iraq War veteran, but she became caught up in drug addiction. He knew he had to move out, but he had nowhere to go. While he was looking for a place to live, he learned his niece had been sexually assaulted, and he began feeling anger he couldn’t control. He went to the urgent care center at the Veterans Affairs Medical Center in Coatesville, Pennsylvania. A counselor at the VA told him about the House of Joseph I (HOJI), the Ministry of Caring’s emergency shelter for men. Burch made an appointment to meet the shelter director, Tony Attaway, but he thought it would be another dead end. He admits to having trust issues with men. He had grown up with an alcoholic father, who showed up drunk to his high-school track meets, if he showed up at all. Attaway said he saw a courageousness in Burch. 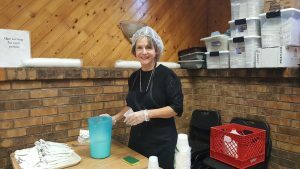 Burch began volunteering at Emmanuel Dining Room, and found comfort in serving those who were even less fortunate than himself. Everywhere he went, he brought his backpack, filled with a notepad and a first-place ribbon he won in a singing contest. He discovered he was eligible for significant financial support due to his combat-related medical condition. After about a month at HOJI, he added a new item to his backpack—a key to his new apartment. There’s one HOJI staff member he was eager to show it to—his case worker, Jeremiah Thaara. Several local business are collecting new and gently used coats, hats, scarves and gloves, which the Ministry of Caring will distribute to homeless and poor people. Adult and children’s sizes are needed. To donate an item or to set up a collection point at your workplace or other site, please call 302-652-5523 or email mail@ministryofcaring.org. Order your desserts by Friday, November 18 at Noon and pick your location. All desserts are $20 each, except the Annivesary Special Pellman chocolate chip cheesecake for $25. 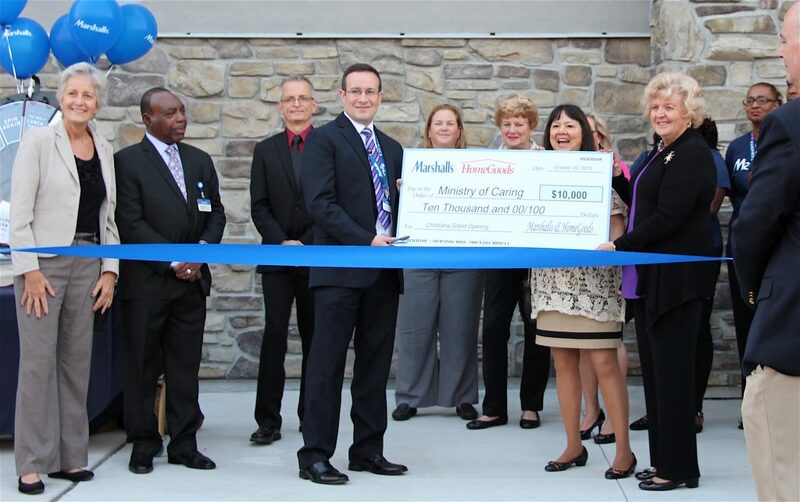 The TJX Foundation, the charitable arm of the TJX Companies, which owns Marshalls and HomeGoods, presented the Ministry of Caring with a donation of $10,000 at the opening of the new Marshalls store in Christiana, Delaware! The money will benefit Mary Mother of Hope House II and III, emergency shelters for women with children. We are so grateful to have this support. Thank you, TJX! Wednesdays are very special to me. It is the day I have the privilege of serving the guests of the Emmanuel Dining Room. I am a newbie volunteer to the Ministry of Caring. Rita and Tom Sweeney have been doing it for 25 years, so they taught me the ropes. Ann Trzuskowski, another Wednesday volunteer, told me that about 20 years ago Mark Reardon asked her if she could drop off some doughnuts for him because he had a meeting and she said sure. She has been coming ever since. We have a lot of fun working together. My husband, Buzz, and I have been doing it for about two-and-a-half years every Wednesday. The other volunteers do every other Wednesday but have been doing it for a much longer time. The camaraderie is great and the caring for each other and all the people we serve is palpable. There is a commitment to make the start of our guests’ day the best it can be. Great care is taken to make the oatmeal, display and serve the doughnuts, juice and coffee in a manner that would appeal to each of us. I am in charge of the beverages, so I ask each guest if they would like some milk in their oatmeal, serve glasses of milk and ice water. When I first started, a few people mentioned to me that the milk and water weren’t cold enough. So I remedied that by making more trips to the refrigerator, so that the cartons don’t sit out too long, and by keeping a bucket of ice handy to replenish ice when needed in the water. A small effort, but something that really makes them happy. The company I work for, Veritext Legal Solutions, loved to hear stories about the people that come in and what a wonderful job the Ministry of Caring is doing for so many deserving people in our community. Veritext asked what they could do to help, so we participate in the Delaware Charity Challenge and have raised over $5,800 a year for the past two years which is directly donated to the Ministry. Also, I was instructed I could only allow people one glass of milk. I reached out to my daughter-in-law, who is an executive at Wawa, and told her that it’s pretty hard to tell somebody they can’t have a second glass of milk. Wawa stepped up and gave us a donation so that we no longer have to say no. You become very familiar with a number of people. The first few weeks I volunteered I had to turn away a few times to dry my eyes because it really broke my heart to observe the plight of many of our guests, but as time moved on I learned to focus on what I can do, not what I can’t. I can’t cure poverty, but I can deal with each individual who crosses my path one by one and treat them with the courtesy, dignity and love that I would hope people would treat me with if the roles were ever reversed. So Wednesday mornings are special — they’re fun, they’re fast, they’re touching and in a very small way they make me feel that I am doing SOMETHING to help. God bless my fellow volunteers and all involved with the MOC. We know the Christmas season isn’t here yet, but it’s not to early to start preparing! 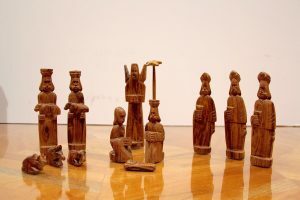 We are selling 30 of these beautiful wooden Nativity scenes for $30 each. Proceeds will benefit our programs for the poor. To purchase one, contact Sister Gretchen at (302)652-5523.